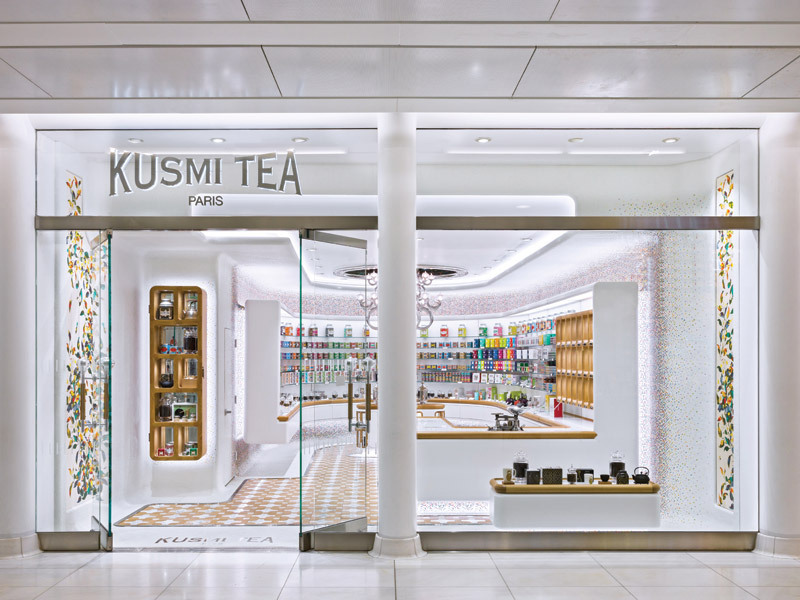 Christopher Jenner has completed the New York flagship for luxury tea brand, Kusmi Tea by delivering a new interior concept for its stores in the United States and emerging markets. 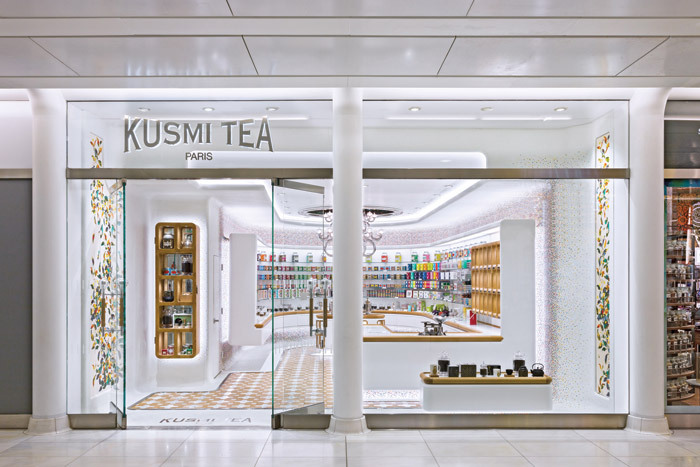 Briefed to design a new concept that would balance Kusmi’s baroque Russian heritage with the brand’s French provenance, the New York store draws inspiration from French savoir-faire and Russian iconography, while craft and technology also feature in the scheme. 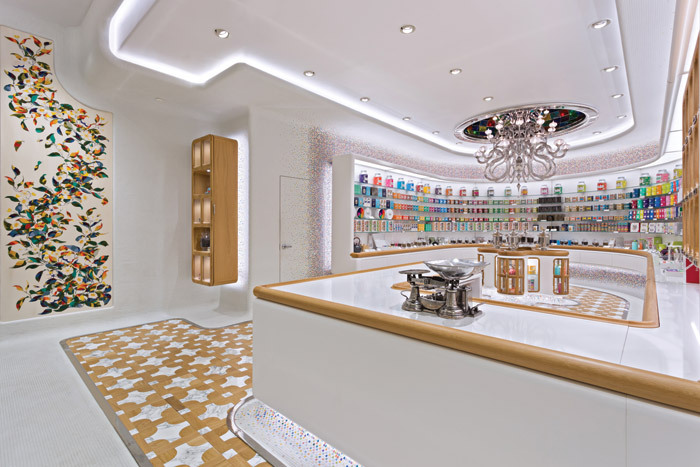 ‘The USA is not a tea-drinking culture and the objective was to design an environment that would draw consumers into the space while providing a platform to communicate the heritage and values of the brand,’ explains Jenner. 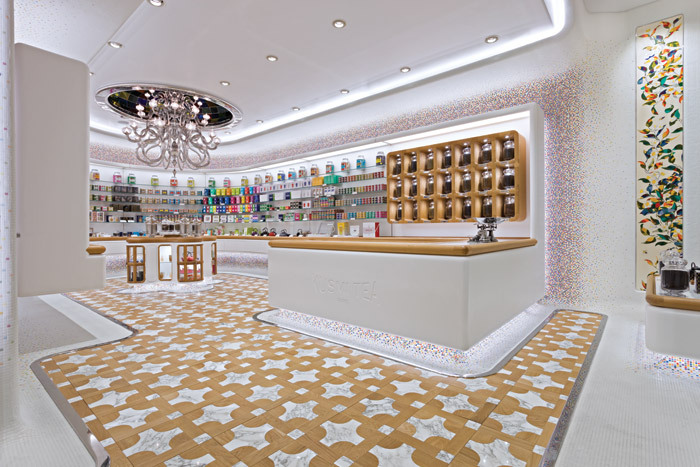 In the store an elegant bespoke floor in Italian marble and French oak, stylised as a Russian Orthodox cross, sits below a magnificent three-tiered, stainless-steel chandelier, produced using a CNC router. 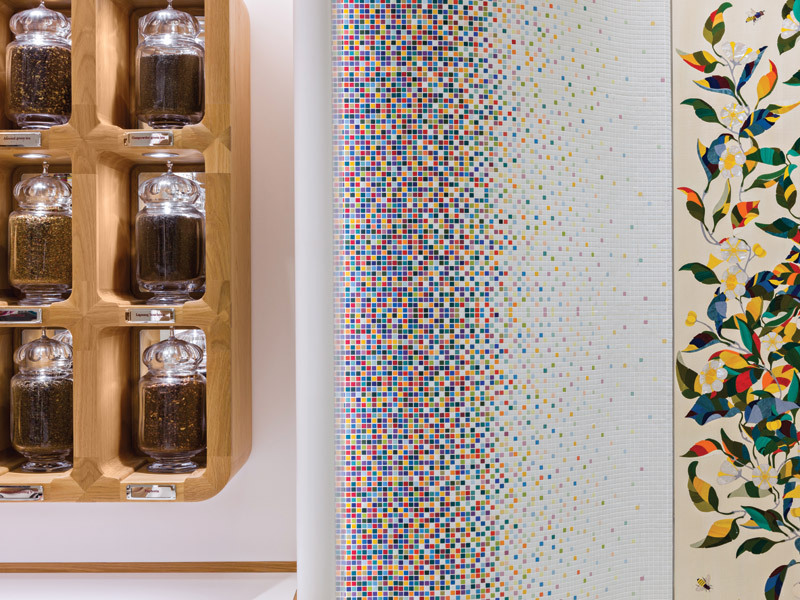 Its 30 interlaced, organic arms connect to a central shaft of multiple-turned components that disappear into a multicoloured stained-glass onion dome, set within the ceiling. 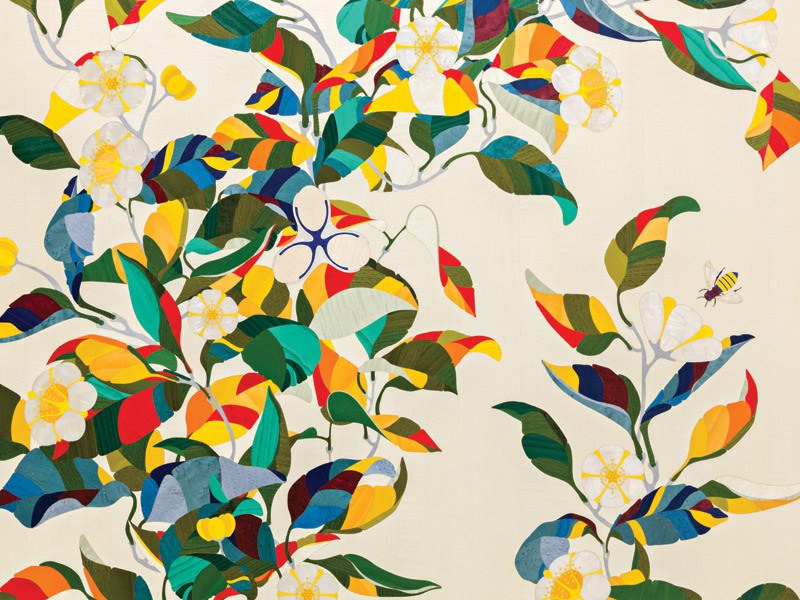 ‘This layering connects consumers with the brand; natural materials and pattern were used in the design to create a sense of narrative,’ says Jenner. 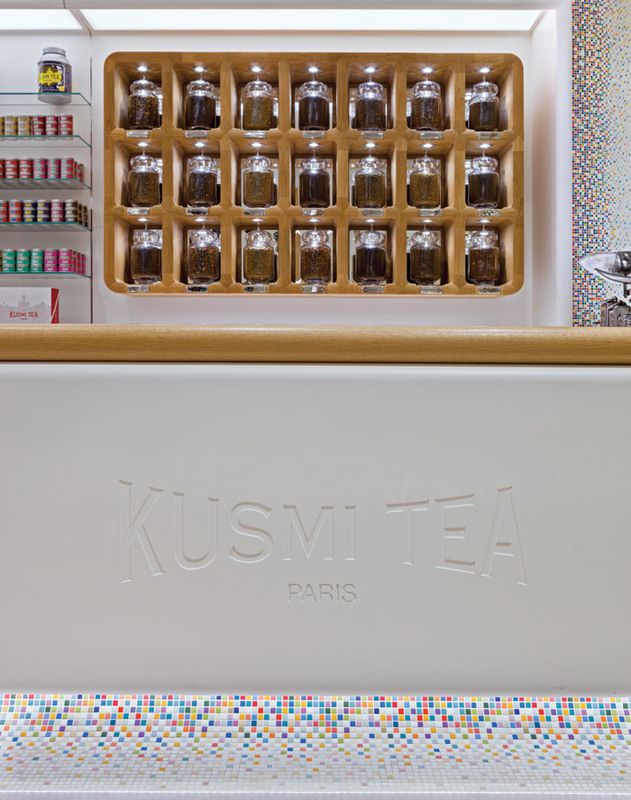 The design for Kusmi’s tea packaging was a starting point for the design team and leading to a special collaboration with Bisazza. 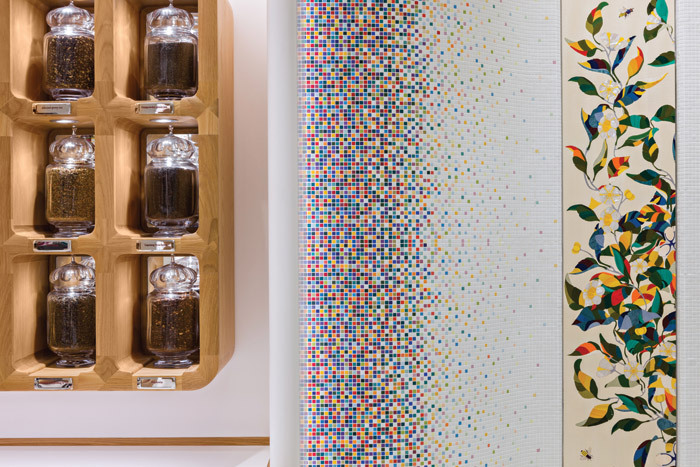 Matt white mosaic glass tiles are set into an abstract pattern of primary and secondary colours and fade in at floor-plinth height as well as framing back-lit display cases. 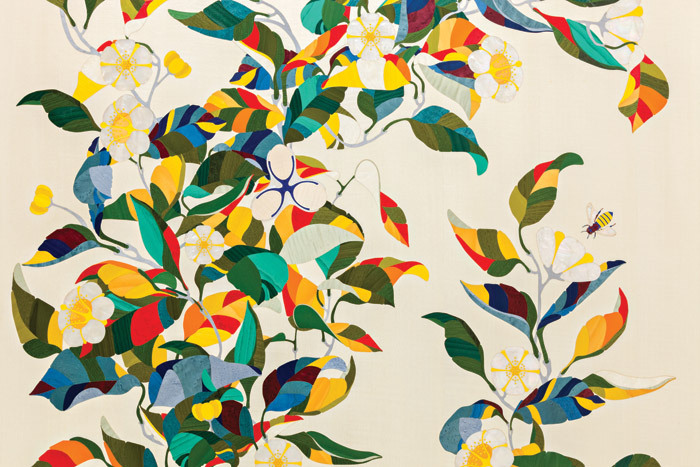 Two large, stylised illustrations inspired by the shrub Camellia Senensis, whose leaves and buds are used in tea making, feature in beautiful marquetry. 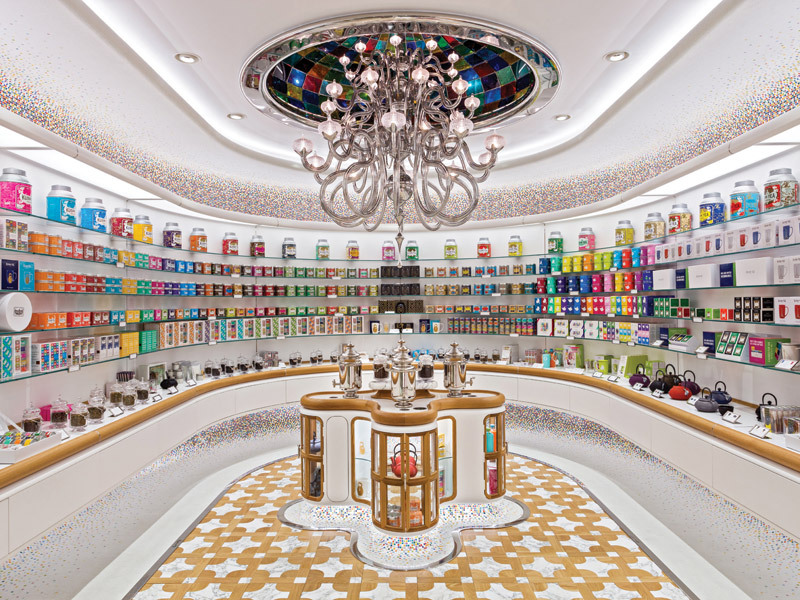 Painstakingly produced in more than 30 coloured veneers and mother-of-pearl, they capture ‘traditional craft with modern expression’ and pay tribute to the art of tea blending. The project took close to 30 months, which Jenner describes as being ‘abnormally long’, owing to numerous on-site delays, including flooding. Delays also came from work on the World Trade Center’s site being reserved for union workers, meaning Jenner and his team were handed an exclusive list of contractors. ‘It was an extremely irritating process that allowed no scope to employ a team we would have chosen for a project of this nature,’ he says. 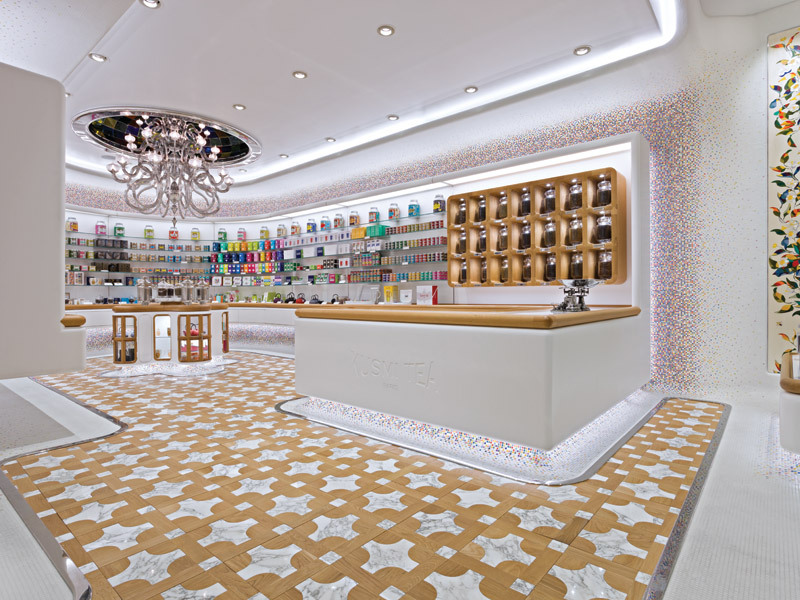 But despite being somewhat dogged by challenges, the end result is spectacular. 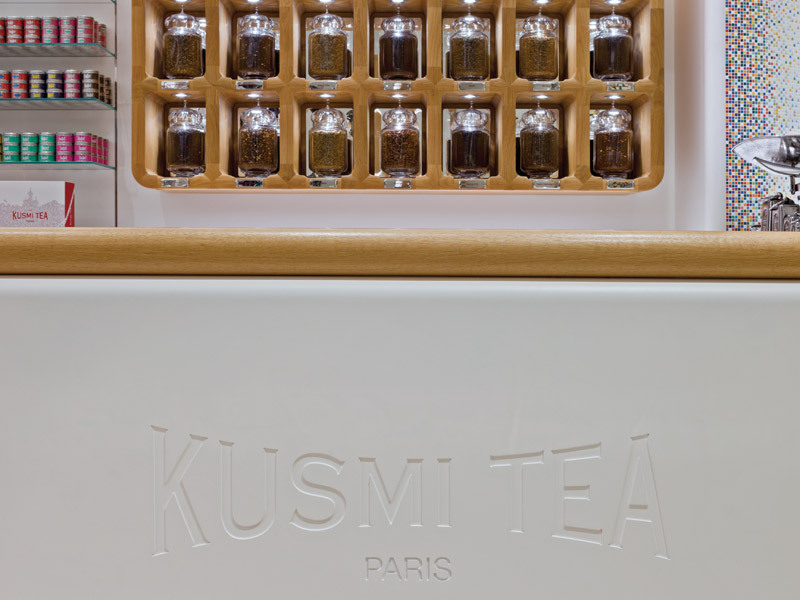 ‘The single-sweep, layered showcase around the back of the store and to the right are particularly impactful, perfectly presenting the special coloured packaging for which Kusmi is famous,’ says Jenner while also pointing out that the space doesn’t feature a single corner edge.